Whether you’re looking for a card for your mom, your wife, grandmother, sisters, or in-laws, Treat has the card for you. Their cards are top-quality and you have 100% control of the content. 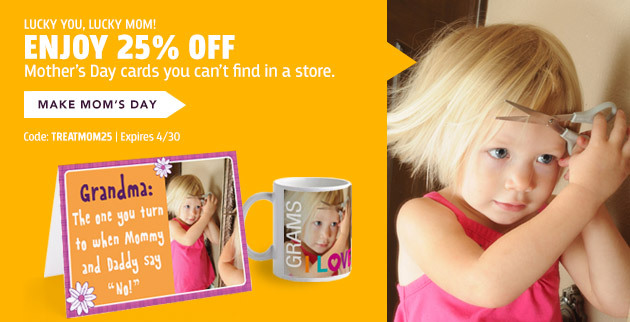 They have 450+ Mother’s Day designs to choose from, ranging from funny to sentimental. You add your own pictures and text to make them uniquely your style. The best part is that right now you can get 25% off all Mother’s Day orders by using the code TREATMOM25. The offer ends at 11:59pm PT on April 30! thanks for sharing. i love Treat! Thanks very much for the card! I’m going to pass this along to my adult daughters lol, maybe they’ll get the hint! Thanks for sharing . I love to look for cards, especially for my mom. Hello, Stacie. Enjoyed this post as it introduced me to a new company. I like this idea a lot – I find ti so hard to buy cards that say what I want & an added bonus to add my pictures to them, too.